Ellen White (1827-1915): “Judas pressed next to Christ on the left side; John was on the right. If there was a highest place, Judas was determined to have it, and that place was thought to be next to Christ” (DA, p. 644). Alfred Edersheim (1825-1889): “We know from the gospel narrative that John occupied the place on His right, at the end of the divans… at the head of the table. But the chief place next to the Master would be to His left… and we believe it to have been actually occupied by Judas” (Life and Times of Jesus the Messiah, Vol. 2, p. 494, 1883). Ellen White (1827-1915): “Judas, in choosing his position at table, had tried to place himself first, and Christ as a servant served him first. 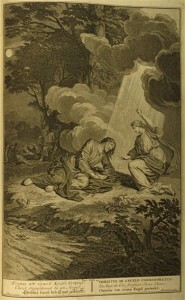 John, toward whom Judas had felt so much bitterness, was left till the last” (DA, p. 645). William Hanna (1808-1882): “One of the first before whose feet the Saviour stooped may have been Judas. We shall see presently that he had thrust himself into a seat very near to, if not next to that of Christ” (The Life of Christ, p. 609, 1863). John Chrysostom (A. D. 347-407): “Now He seems to me to have washed the feet of the traitor first from its saying, (John 13:5) He began to wash the disciples’ feet, and adding, (John 13:6) He Then comes to Simon Peter and Peter says unto Him, Lord, do You wash my feet?” (Homilies on the Gospel of John Chrysostom, Homily 70). The bible references added. Ellen White (1827-1915): “He, the spotless Lamb of God, was about to present Himself as a sin offering, that He would thus bring to an end the system of types and ceremonies that for four thousand years had pointed to His death. As He ate the Passover with His disciples, He instituted in its place the service that was to be the memorial of His great sacrifice. The national festival of the Jews was to pass away forever. The service which Christ established was to be observed by His followers in all lands and through all ages” (DA, p. 652). Daniel March (1816-1909): “Just about to offer himself, the pure and spotless Lamb of God, in the great and only efficacious sacrifice for sin, he finishes the sacrifice of four thousand years by eating the Passover with his disciples. In the place of the national festival which the Jewish people had observed from the days of Moses, he institutes a memorial service, to be kept by his followers of every nation to the end of time” (Walks and Homes of Jesus, p. 307, 1868). 4. Crowning evidence of His Messiahship (DA, Ch. 72). Ellen White (1827-1915): “In pronouncing the woe upon Judas, Christ also had a purpose of mercy toward His disciples. He thus gave them the crowning evidence of His Messiahship. “I tell you before it come,” He said, “that, when it is come to pass, ye may believe that I AM” (DA, p. 655). William Hanna (1808-1882): “This exposure and denunciation of the traitor may have been one of the needful steps in the accomplishment of the divine designs… one of his reasons for acting as he did towards Judas was to afford to other apostles an evidence of his Messiahship… Now I tell you before it come, that, when it come to pass, ye may believe that I am he” (The Life of Christ, p. 616, 1863). Ellen White (1827-1915): “Had Jesus remained silent, in apparent ignorance of what was to come upon Him, the disciples might have thought that their Master had not divine foresight, and had been surprised and betrayed into the hands of the murderous mob. A year before, Jesus had told the disciples that He had chosen twelve, and that one was a devil. Now His words to Judas, showing that his treachery was fully known to his Master, would strengthen the faith of Christ’s true followers during His humiliation” (DA, p. 655). William Hanna (1808-1882): “Had nothing been said beforehand by Jesus, had everything run the course it did, their Master remaining apparently in profound ignorance of how his arrest in the garden was to be brought about, then the apostle’s eyes this mystery would have hung around the whole procedure: that Jesus had been deceived , had suffered a traitor to enter unknown and undetected into the innermost circle of his friends, had fallen by unexpected blow from the hand of one fancied to be friendly” (The Life of Christ, p. 617, 1863). Ellen White (1827-1915): “The light shining from that Communion service in the upper chamber makes sacred the sacred provisions for our daily life. The family board becomes as the table of the Lord, and every meal a sacrament” (DA, p. 660, 1898). Samuel Henry Kellogg (1839-1899): “And so, eating in grateful, loving fellowship with our Heavenly Father that which his bounty gives us, to his glory, every meal shall become as it were, a sacramental remembrance of the Lord” (The Book of Leviticus, p. 373, 1891). Charles H. Spurgeon (1834-1892): “To the true believer his common garments are vestments, every meal is a sacrament, every act is a sacrifice” (Spurgeon’s sermon on Prayer, Vol. 29, p. 7, 1883). John Harris (1802-1856 ): “His people are to turn every act into devotion; to make every meal sacramental, a token and pledge of infinite love” (The Great teacher, p. 440). Percy Dreamer (1867-1936): “All our meals and all our living make as sacraments of Thee” (Seventh-day Adventist Hymnal, No. 259, 1985). Ellen White (1827-1915): “He knew that when He should exclaim, “It is finished,” all heaven would triumph… He knew that the knell of Satan’s empire would then be sounded…” (DA, p. 679). John Harris (1802-1856): “He knew, that when he should exclaim, ‘It is finished,’ the powers of darkness would hear in that cry, the knell of their empire” (The Great Teacher, p. 236, 1835). F. W. Farrar (1831-1903): “…but from the hour when Christ died began the death-knell to every Satanic tyranny and every tolerated abomination” (The Life of Christ, Vol. 2, p. 420, 1874). Ellen White (1827-1915): “The power of evil has been strengthening for centuries…Sin could be resisted and overcome only through the mighty agency of the third person of the Godhead, who would come with no modified energy, but in the fullness of divine power” (DA, 671). John Harris (1802-1856 ): “… how tremendous then must that principle of evil be, which can only be subdued by the mighty power of the Spirit; by the advent and accession of the third person in the awful godhead; by no modified energy, but by the full almightiness of divine power” (The Great teacher, p. 182, 1835). Ellen White (1827-1915): “Christ rejoiced that He could do more for His followers than they could ask or think. He spoke with assurance, knowing that an almighty decree had been given before the world was made. He knew that truth, armed with the omnipotence of the Holy Spirit, would conquer in the contest with evil; and that the bloodstained banner would wave triumphantly over His followers” (DA, p. 679). John Harris (1802-1856 ): “A part of the which was set before him… in which his truth, armed with the omnipotence of the holy Spirit, having completed the conquest of error, given law to the world, and impressed her image on every thing human” (The Great Teacher, p. 83, 1835). Ellen White (1827-1915): “Cumbered with humanity Christ could not be in every place personally. Therefore it was for their interest He should go to the Father and send the Spirit to be His successor on earth” (DA, p.669, 1898). William Burkitt (1650-1703): “That Christ, being ascended into heaven in our human nature, shall abide and continue there until the restitution of all things, and his corporeal presence here on earth is not to be expected, until he has put all his enemies under his feet… and Papist’s dream; who ascribe to Christ’s human nature the property of a Godhead; namely, to be in ten thousand places at the same time, contrary to the nature of a human body” (Expository Notes On The New Testament, Acts 3:20, 1703). 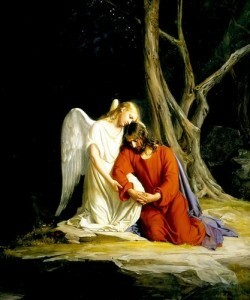 Ellen White (1827-1915): “…the saviour slowly made His way to the garden of Gethsemane. The Passover moon, broad and full, shone from a cloudless sky. The city of pilgrims’ tents was hushed into silence” (DA, p. 685). Ingraham J. H (1809-1860): “…we passed through the gloomy streets, and forth from the gate, which Pilate suffered to be open day and night, on account of the crowds at the Passover, coming in and going out. The moon shining brightly, and by its light glancing on the face of Jesus, by whom I walked…entered the dark groves of Olivet” (The Prince of the House of David, p. 317, 1855). Daniel March (1816-1909): “The Passover moon shone from a sky which at that season seldom has a cloud. The lights in the city had gone out, the streets were silent, the voices were hushed in the tents of pilgrims on the hill – sides” (The Night scenes in the Bible, p. 403, 1868). 12. Satan tempting Jesus in Gethsemane (DA, Ch. 74). Ellen White (1827-1915): “Now the tempter had come for the last fearful struggle. For this he had been preparing during the three years of Christ’s ministry… Satan told Him that if He became the surety for a sinful world, the separation would be eternal… And what was to be gained by this sacrifice? How hopeless appeared the guilt and ingratitude of men! In its hardest features Satan pressed the situation upon the Redeemer” (DA, pp. 686, 687). Anne Catherine Emmerich (1774-1824): “… the tempter was permitted to do to him what he does to all men who desire to sacrifice themselves in a holy cause. In the first portion of the agony, Satan displayed before the eyes of our Lord the enormity of that debt of sin which he was going to pay… “And what good will result from this sacrifice?” Then a most awful picture of the future was displayed before his eyes… Our Saviour beheld with bitter anguish of the ingratitude and corruptions of the Christians of the first and of all succeeding ages, even to the end of the world, and during the whole of this time the voice of the tempter was incessantly repeating: “Canst thou resolve to suffer for such ungrateful reprobates?” (The Dolorous Passion of Our Lord Jesus Christ, pp. 103, 107, 1862 ). Ellen White (1827-1915): “The cypress and palm trees were the silent witnesses of his anguish” DA, p. 689). John Ross Mac Duff (1818-1895): “Pomegranate and cypress, olive and palm which encircle His solitude – the silent witness of His unspeakable anguish” (Memories of Olivet, p. 315, 1868). Ellen White (1827-1915): “A short time before, Jesus stood like a mighty cedar, withstanding the storm of opposition that spent its fury upon Him…Now He was like a reed beaten by the angry storm” (DA, p. 689). John Mac Duff (1818-1895): “A few moments before, He is the mighty cedar: now He is a bruised reed…now every billow seems crested with wrath and woe” (Memories of Olivet, p. 215, 216, 1868). Bible: And there appeared an angel unto Him from heaven, strengthening Him (Luke, 22: 43). Nothing more was said about this. 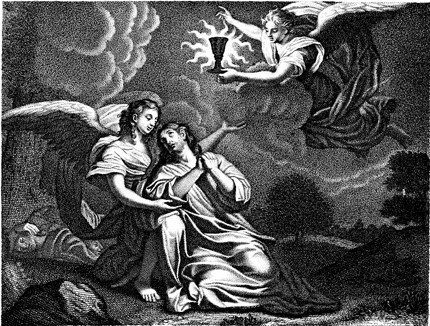 Ellen White (1827-1915): “They saw the angel bending over their prostrate master. They saw him lift the Saviour’s head upon his bosom, and point toward heaven. They heard his voice, like sweetest music, speaking words of comfort and hope” (DA, p. 694). Note: These extra-biblical insights of Ellen white describing the agony of Jesus can be traced to Biblical Art produced between the 15 and 18th centuries, and to the work of fiction by Ingraham J. H.
Ingraham J. H (1809-1860): “…an angel stood by the side of Jesus, bending over him, and raising him from the ground…never had we beheld a human visage so marred by sorrow so deeply graven with the lines of agony. The angel seemed to utter soothing words, and pointed , with his shining hand, towards heaven, as if to encourage him with hope, and give him strength” (The prince of the House of David, pp. 318, 319, 1855). Bennett James (1774-1862): “In what way the angel strengthened our lord we know not. We naturally think of the angel as standing by the Saviour, stretching out an arm to raise him from the ground, presenting a sympathizing bosom on which the aching head or throbbing bosom of Jesus might lean, and supporting his staggering steps, when going again to his disciples” (Lectures on the History of Jesus Christ, p. 342, 1828). Ellen White (1827-1915): “…and the mighty angel who stands in God’s presence, occupying the position from which Satan fell, came to the side of Christ. The angel came not to take the cup from Christ’s hand, but to strengthen Him to drink it, with the assurance of the Father’s love” (DA, p. 693). Ellen White (1827-1915): “In the supreme crisis, when heart and soul are breaking under the load of sin, Gabriel is sent to strengthen the divine Sufferer, and brace him to tread his blood-stained path. And while the angel supports his fainting form” (ST, December 9, 1897). Bennett James (1774-1862): “It has been conjectured that it was Gabriel who stands in the special presence of God, who signifies the mighty hero of God, and who having appeared to announce Christ’s birth, now came to indicate that all the celestial intelligences took part with Jesus who was fighting the battles of heaven against sin and hell!” (Lectures on the History of Jesus Christ, p. 342, 1828). Ellen White (1827-1915): “They saw His face marked with the bloody sweat of agony, and they were filled with fear. His anguish of mind they could not understand. His visage was so marred more than any man, and his form more than the sons of men” (DA, p. 690). See the illustrations below. Ingraham J. H (1809-1860): “As the angel raised Jesus from the ground, we saw that His countenance was convulsed with anguish; and upon his brow stood great drops of sweat, mingled with blood… dropped to the ground. Never had we beheld a human visage so marred by sorrow, so deeply graven with lines of agony” (The Prince of the House of David, pp. 381, 319, 1855). Ellen White (1827-1915): “They saw His face marked with bloody sweat of agony…He might wipe the bloody sweat from His brow” (DA, p. 690, 1898). Alfred Edersheim (1825-1889): “The disciples must still have seen on His brow the marks of bloody sweat. His sweat mingled with blood, fell in great drops on the ground” (Life and Times of Jesus the Messiah, Vol. 2, p. 539, 1883). Charles Spurgeon (1834-1892): “We read, that “he sweat as it were great drops of blood.” Hence a few writers have supposed that the sweat was not actually blood, but had the appearance of it. That interpretation, however, has been rejected by most commentators, from Augustine downward, and it is generally held that the words “as it were” do not only set forth likeness to blood, but signify that it was actually and literally blood…We believe, then, that Christ did really sweat blood. This phenomenon, though somewhat unusual, has been witnessed in other persons” (Gethsemane, Sermon Delivered on February 8, 1863). 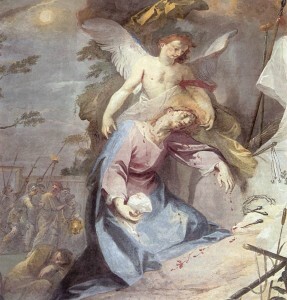 Anne Catherine Emmerich (1774-1824): “But at the sight of Jesus, thus bathed in his own blood, and sinking to the ground beneath the mortal fear and anguish, he [Peter] drew back, and paused for a moment, overcame with terror” (The Dolorous Passion of Our Lord Jesus Christ, pp. 107, 1862 ). Anne Catherine Emmerich (1774-1824): “I saw the blood flowing in large drops down the pale face of our Saviour” (Ibid., p.111). 19. He staggered as he came to his disciples (DA, Ch. 74). Ellen White (1827-1915): “Rising with painful effort, He staggered to the place where he had left His companions… fainting and exhausted, He staggered back to the place of his former struggle” (DA, pp. 688, 689). Anne Catherine Emmerich (1774-1824): “I saw him stagger from side to side, sometimes raising himself up, and sometimes falling again… But he tottered as he walked; his appearance was that of a man covered with wounds and bending beneath a heavy burden, and he stumbled at every step” (The Dolorous passion of Our Lord Jesus Christ, pp. 109, 111, 112, 1862 ). Ellen White (1827-1915): “Christ might even now refuse to drink the cup apportioned to guilty man. It was not yet too late. He might wipe the bloody sweat from His brow, and leave man to perish in his iniquity. He might say, Let the transgressor receive the penalty of his sin, and I will go back to My Father” (DA, p. 690). John Ross Mac Duff (1818-1895): ““What shall I say?” Shall it be, ‘This cup must pass – I shall dash it untasted to the ground – I shall cancel my covenanted engagements – I shall escape this travail of soul – wipe the blood drops from my brow – cast the garb of flesh aside, and ascend to my Throne above the stars of God?’…. “save Himself,” and leave a world and its myriads to perish?”” (Memories of Olivet, pp. 324, 325, 1868).